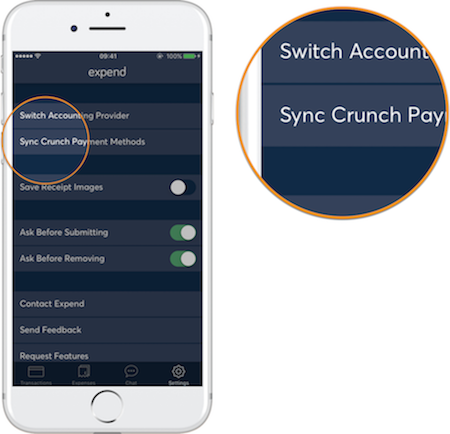 Here are the basic things you need to do to get started using your Expend card with Crunch and the Expenses for Crunch app. Before you start using your Expend card, set it up as a payment method in Crunch. It will be selected by default as payment method for expenses created from Expend card transactions. Step 1: Go to Crunch and log in to your account. Click the Banking tab, and then click New bank account. Step 2: Fill in the required details (we suggest using “Expend” in the first two fields) and then click Save bank account. 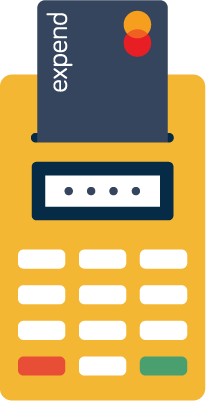 Do your very first transaction at a standard chip and PIN terminal where you insert your card and key in your PIN. This will fully activate your card, after which contactless payments will be available. On the opening screen, tap I have an Expend account. Enter your Expend account details. Use the email address and password you provided when you ordered your Expend card. On the opening screen, tap Use without Expend account. Select your accounting provider and follow the steps to connect to your accounting provider. You can top up your Expend card by doing a bank transfer. In the Expend app, on the Transactions tab, tap Your Card in the top left corner (where your balance is also shown) and then tap Add Money. This gives you the details you need. Set up Expend as a company account in Crunch. In Crunch, go to Banking > New bank account, fill in the required details – we suggest entering “Expend” in the first two fields – and click Save bank account. Then, in Expend, go to Settings > Sync Crunch Payment Methods. Your card will become available as a payment method in the app. Top up your Expend card from your main company account. Record this transaction as a transfer between the two company accounts. Reconcile by exporting your Expend card transactions to CSV.In Expend, go to Transactions > Reports > Export All Transactions and export your transactions as a CSV file. If required, use Excel or a text editor to edit the file. You can then upload this CSV file as a statement in Crunch. To do this, go to Banking > Add new > Statement. Topping up from your personal bank account is also a possibility, but you would miss out on some of the advantages of combining the Expend card with Crunch, such as automatic selection of the correct payment method for expenses created from your Expend card transactions. All transactions performed with your Expend card appear on the Transactions tab. To create an expense, tap any payment transaction on the Transactions tab, and then tap Create Expense button. We'll fill in all the details captured from the card transaction. You can optionally add an image of the receipt, fill in any other details, and then tap Submit. Your expense will be synced instantly with Crunch. You can also save the expense as a draft if you tap Cancel, and complete it later. 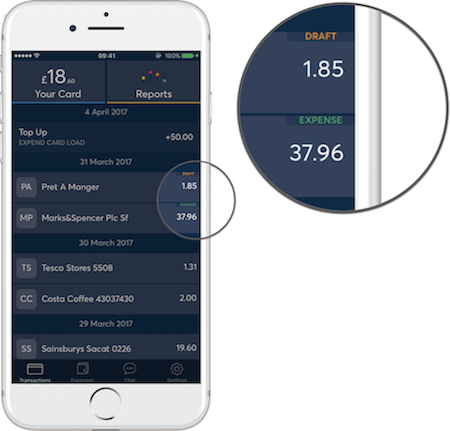 The app shows you which transactions have been processed as expenses with labels on the right. An “Expense” label means the expense has been submitted. On the Transactions tab, tap the Reports button in the upper right corner. Tap Export All Transactions, tap CSV, and then select a sharing option. Note: Transactions marked “Pending” in the app aren't exported to the CSV file. Once “Pending” has cleared from a transaction, it will be exported. In Crunch, go to the Banking dashboard, find the Add new list on the right of the page and select Statement. On the Upload Statement page, select your Expend account, and upload the CSV file you exported in Expend. From here, just follow the steps as they are presented by Crunch. Note: We would have loved to automate the reconciliation process, but due to limitations in the Crunch API we couldn't do this. It's possible on other platforms, and we asked Crunch to improve it. Hopefully this is something they will facilitate in future. Until then, importing the CSV file of transactions generated by the Expend app is the way to do it. When you create an expense from a transaction that was originally in a currency other than GBP, it may happen that the amount is slightly different from the original transaction amount. This is because the amount for an international transaction is only fixed at the so-called “clearing” stage. The process works in the way described below. When you pay for something in another currency, the amount you see during authorisation is an approximation. The value only becomes final at the clearing stage. If you create an expense immediately after payment and sync it to Crunch, there is a risk that the amounts may end up being different, since we update the transaction amount (on the Transactions tab in the app) when the transaction is cleared a few days later. Unfortunately, due to the way Crunch’s API works, we can’t go back and change an expense's amount. Basically, we can only create an expense, not update it. There isn't really a fix for this until the API gives us the ability. An alternative approach to how we've done it would have been to delay the creation of the expense in Crunch until the transaction has cleared. The downside of this is that the expense might “disappear” for up to three days before showing up in Crunch. We opted for the current approach to avoid users thinking the expense hasn't been created and possibly ending up creating an expense for the same transaction twice. Ensure that you are signed in to the app with your Expend account, rather than your Crunch account. If you signed in with your Crunch account, you won't be able to activate your card, and you should sign out first. To sign out, go to Settings and tap Sign Out. On the next screen, tap the I Have an Expend Account button, and then enter your Expend username and password (the details you provided when you ordered the card). Ensure you are not logged in to the app (go to Settings > Sign Out if necessary). On the welcome screen, tap I Have an Expend Account. Enter your email address and follow the instructions that you receive. Ensure that you exported a statement and not your expenses. To export a statement, go to the Transactions tab and tap Reports. This exports a statement with your transactions. Ensure that you didn't try to do the export by tapping Export on the Expenses tab. That exports a file with your expense data and cannot be used for reconciliation.